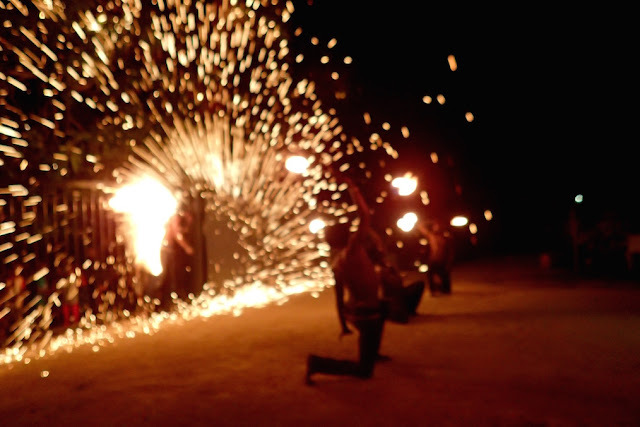 Galley Wench Tales: VANUATU: Fire Dancers! Yikes! Must’ve hurt to learn to get this impressive fire-breathing stunt! Vanua Fire, performing in Port Vila, Vanuatu. Vanuatu, Port Vila. “There’s a fire dancing show where we’re staying. 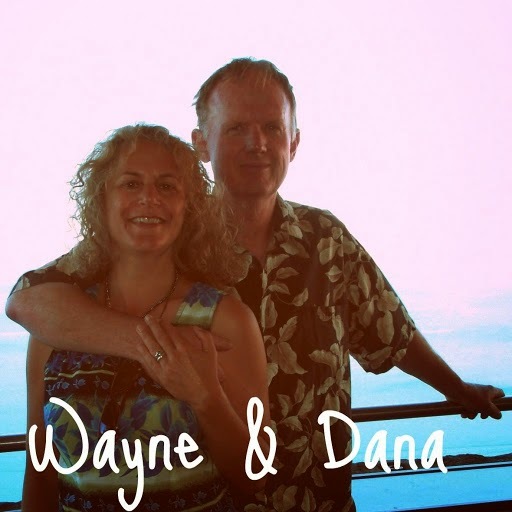 Would you like to see it?” asked Wayne’s folks, who flew to Vanuatu to join us once again for some cruising – last time they crewed us through the Panama Canal. They were spending a little time ashore, bracketing their time aboard our tiny boat. Sounded good to Wayne and me. 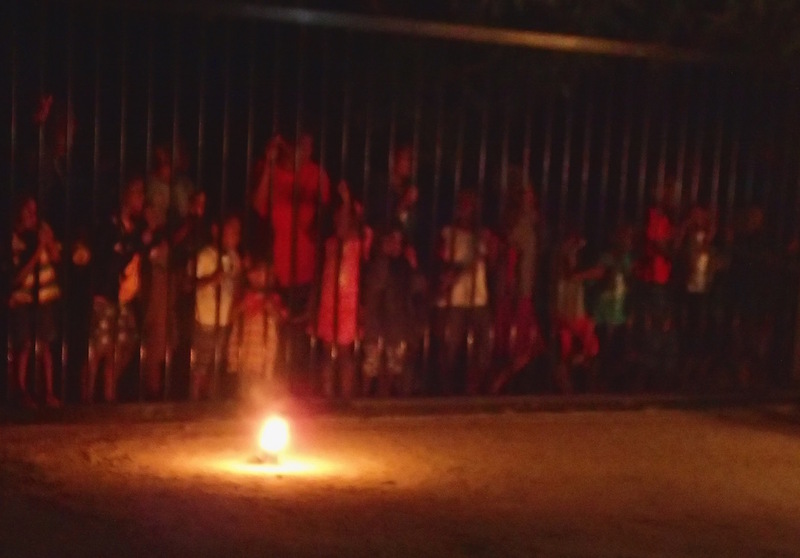 We enjoyed the little bit of fire dancing we saw in Tonga, as part of an overall culture show, thanks to the Blue Water Festival. More? Yeah! Serious sparklers! We’d really have found ourselves in the hot seat if we hadn’t moved! Vanua Fire, dancers, Port Vila, Vanuatu. Traditionally, fire dancing isn’t a Vanuatu thing*, the Vanua Fire dancers are hot. A bunch of formerly unemployed Vanuatu teens and twenty-somethings, their fire dancing performances are now garnering Vanua Fire international demand. *Per wikepedia, the Aztecs originated fire dancing to pay homage to their fire God, Xiuhetcuhtli, and in more recent years, Bali, French Polynesia, Antigua, Cuba and St. Lucia horned into Mexico’s fiery performance art – not to mention Burning Man. Vanua Fire began in 2011 on request of a Vanuatu beach club owner who thought it would be good for business. do not set my hair on fire!”? Vanua Fire, Port Vila, Vanuatu. It was. It was also good for Vanua Fire, who now play 2-3 venues a night around Port Vila, as well as for hire for special events, like weddings. Given their busy schedule, bouncing from one venue to the next, we missed the first few minutes of their show, as it started early while we were still eating dinner. A few minutes after we sat, we were frantically moved from the chairs that had been set up. Before long, the reason for the move was clear, as one performer's chain scattered sparks, flying far and wide across the courtyard, right where our chairs were moments before! As if that wasn’t impressive enough (along with all the fiery baton-twirling, jump roping and other sundry dance moves), these lithe folks threw in some impressive gymnastic Circe du Soleil-type moves, too. Amazingly, Vanua Fire’s performances are free – though we happily tipped them at the end of their fabulous performance. It’s fortunate the day Vanua Fire performed was one of the few sunny, non-rainy days during Phil and Gunnel’s Vanuatu’s “dry season!” Sadly, the weather conspired to keep us moored on Efate, not much of a cruising experience for Wayne’s Dad and Gunnel. We’re glad they took a long day to fly off to Tanna, Vanuatu’s still very active volcanic Mt. Yassur and that too, was on a mostly dry and sunny day. 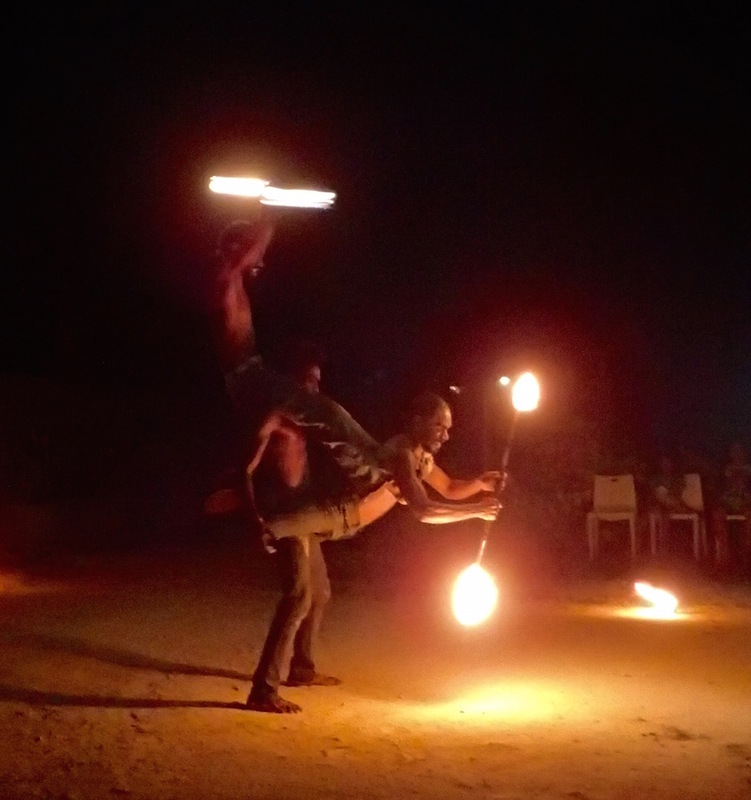 Who cares if Vanuatu is a Johnny-come-lately when it comes to fire dancing? For a country about the size of Connecticut, one of the few United States smaller than Rhode Island, yet formed by 24 volcanoes (two of them still spewing), where else would fire dancing be more appropriate? 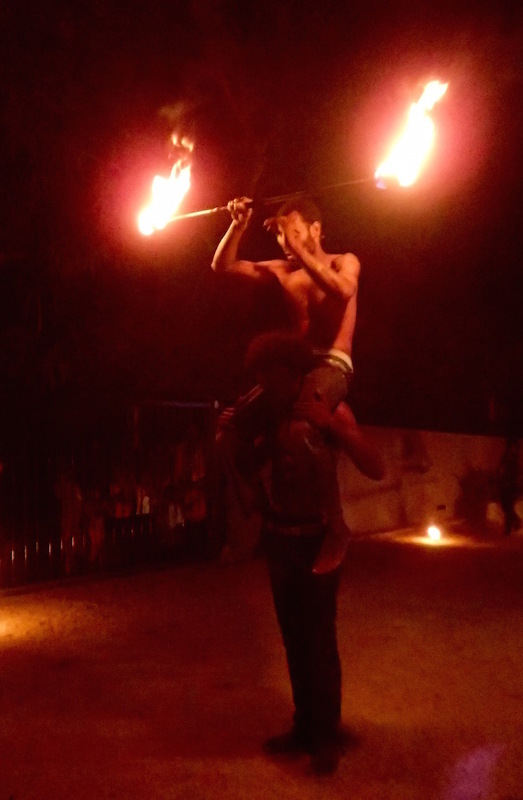 A triple-fiery acrobatic treat, Port Vila fire performers, Vanuatu. This recent retrospective was from two weeks ago, August 12, 2016, when we anchored off Vanuatu's Port Vila, Yachting World Marina, (S17.44.722 E168.08.848). 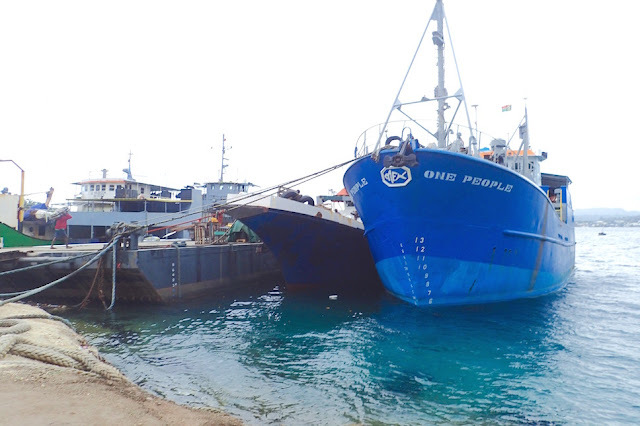 We are currently moored off Lol tong, Pentecost, Vanuatu (S15.32.720 E168.18.726). There’s still several catch-up Fiji posts coming, as well as catch-up posts on Vanuatu’s Efate, volcanic Ambrym, and Pentecost. Holy cow – Mom and Dad would do a meltdown if we’d ever tried anything like these sparklers for the Fourth of July. 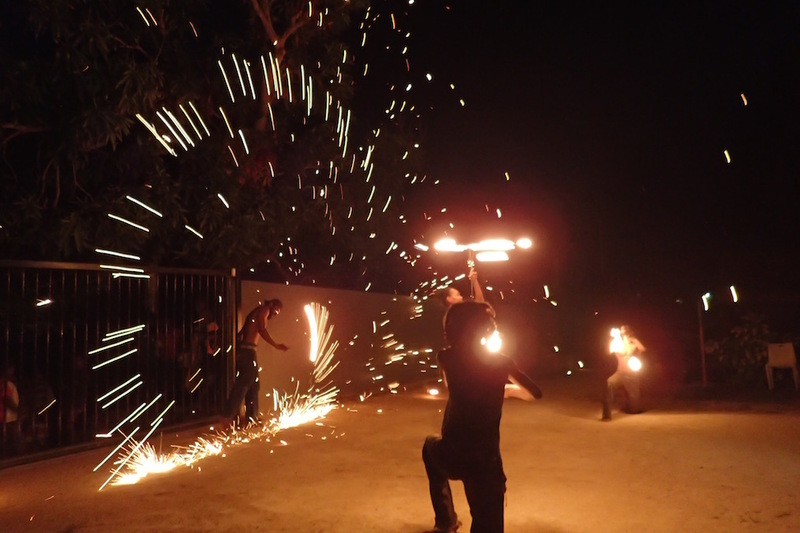 Vanua Fire, performing in Port Vila, Vanuatu. After Vanuatu, New Caledonia. After New Caledonia, Australia, by December 2016 (but probably earlier). There, we plan to sell our boat, and go back to work, somewhere. 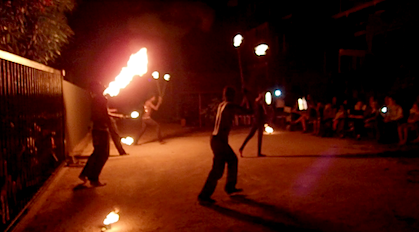 And someday, this post will be updated with my fire dancing video clip… as time and decent wifi bandwidth allow.